It has been some days since I’ve been back from the amazing Mozilla Festival and its time to post about all the amazing things I’ve seen and done over there. This event was probably the most engaging “tech” event I’ve ever been. The whole mindset of sessions and facilitators is something that we should replicate all around the globe. In my humble opinion this event represents the best of the Mozilla mission and spirit and in these brief words I will try to explain a bit of my wonderful experience over there. I am a Mozilla Rep and love working on Web related stuff. 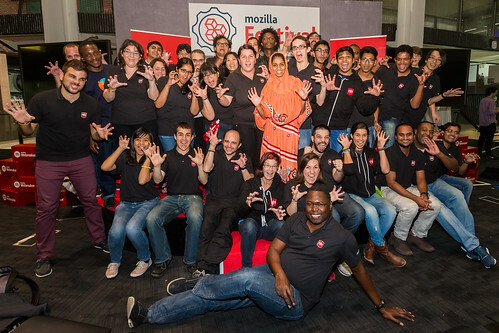 I’ve been to many events around the globe but this was my first MozFest. This event is very different than all other events I’ve been to and part of my experience was shapped by how I got there. There was an application form for Mozilla Reps that were interested in going to the event. I’ve filled it. There was also a public call for sessions and I’ve submit my proposal about teching how to run Mozilla Appmaker on a Raspberry Pi. My session was reject but my trip was approved. So in essence, I was going but I had no idea what I was going to do there. I am almost reaching the point where I can almost release the book. My idea is to release it as an early unfinished preview and allow readers to send feedback and enjoy it while I am still building it. The Google Summer of Code is all about open source creations and its my belief that open source should also be open development so by releasing this book in early form I am able to invite you all to contribute to it. In this brief article I will expose my impressions about the keyboard used in the current Firefox OS version used in tablets. Please be aware that these tablets are reference designs used to improve Firefox OS in tablet form factor. What we see and discuss here is not what the final product will be. This article is for the benefit of the Tablet Contribution Program run by Mozilla. This project aims to improve Firefox OS for tablet usage. An initial run of reference designs were seeded to many contributors who are bringing back improvements. Since we’re Mozilla, we do everything in the open and thats why this article is published here and not on some private walled garden. I’ve been accepted in Google Summer of Code 2014 as a student working with Mozilla. My project (that can be seen here) is about creating game samples, an ebook and some reusable libraries to aid game developers working with Firefox OS. Games count for 50% of the app usage on mobile devices. Let that sink for a bit… Of all app categories, games count for half of the usage and all the other types of app share the remaining fifty percent. Games are so important that many developers distinguish between games and non-games application as being from different realms. No one places spreadsheets app and project management apps in different realms but people think of games as something so broad, so large, that it deserves its own category. If games are so important for mobile platforms then it makes sense that we have great tools and documentation to aid new developers in becoming game developers. The fact is that even though we do have lots of documentation, it is all spread multiple MDN pages and wiki links and personal blogs. We lack a comprehensive collection of knowledge that can be easily followed, understood and shared by new developers. If a game developer wants to learn something about Firefox OS itself then he can just browse MDN Game Development Zone for the information he needs. New developers that want to become game developers have no easy path to follow. To solve this we’re going to build a set of resources that when used together will teach new developers how to develop 2D casual games for Firefox OS. Acho que a galera nas interwebs está confundindo fumaça com fogo. Pra quem não leu como vai funcionar o lance do DRM: O Firefox vai ter uma sandbox para rodar o blob. O blob não vai vir instalado no Firefox. O blob não tera acesso a nada do hardware e não poderá ser utilizado para fazer fingerprint. O código fonte do sandbox é open e você poderá compila-lo separadamente se quiser ter certeza que o seu sandbox não foi macumbado pela NSA. Se você não utilizar os serviços que usam DRM tais como Netflix, Hulu e Amazon então seu Firefox continua livre do dito blob. Se você quiser utilizar esses serviços então você autoriza a instalação do blob de DRM quando você vai assistir alguma coisa. Se você é daqueles que são contra DRM na web então em vez de ficar brigando para não ter os hooks no Firefox basta não utilizar os tais serviços. Se você é daqueles que quer assistir os tais videos na internet então você tem a única sandbox open source incapaz de fazer fingerprint. Continua melhor que as alternativas. 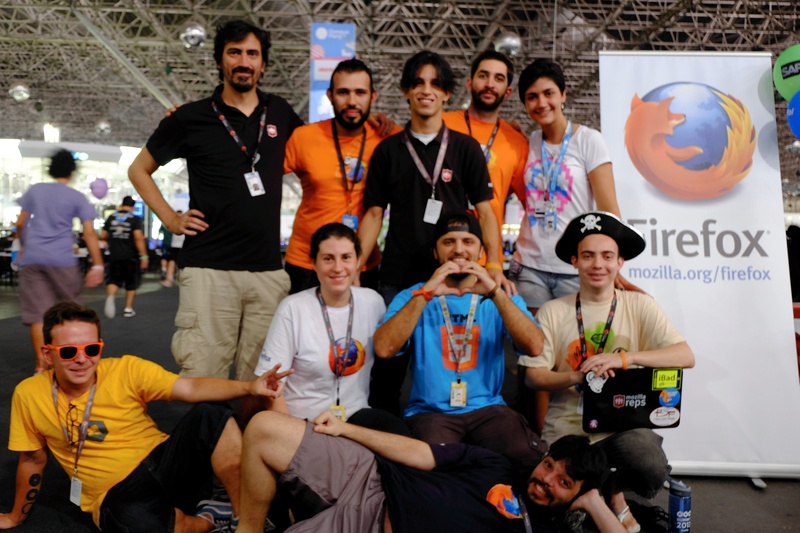 This year we took 15 people (Volunteers + Staff) to Campus Party Brasil which is probably the largest tech event/gathering in the world with eight thousand people camping at the venue and an unknown number of people floating at the expo area. Even though this event was organized at the nick of time, it was one of our best events ever. We had numerous activities planed among them 3 talks at the normal schedule (a.k.a. during the day), 5 talks during community schedules (a.k.a. so late it is almost day again), 1 workshop and 1 hackathon. Once upon a time, there was a frightened and skinny cat named Torresminho, because he raised himself at Noronha Torrezão street, who decided one day to help an SUV driver and change the tire of a moving car. It didn’t work. The driver, mad with the bad service drove away never looking back. Uncle Andre and Aunt Lili who were passing by rescued what was left of the crying-half-broken kitten and drove quickly to the vet clinic. Even though we can rebuild him, we have the technology we can’t actually afford to pay the surgeries and treatment that he needs. Thats why we need your help to make sure this story has a happy ending. Now in plain half-decent English: We were driving back home when we saw a little kitten lying down resting in the middle of the road. We managed not to hit him and stopped our car to rescue to little clueless cat. Lili, my wife, waved the car behind us that she was going to grab the cat. The car was an SUV that was far enough to stop or dodge our group. They never changed course and hit the 45 days old kitten. The driver never stopped, just drove away. We picked the bloodied broken cat and drove to Pet & Vet clinic where he is undergoing treatment. As soon as we rescued him and placed him under the care of the clinic we started a crowdfunding campaign to help treat him but we were naive in how much it would cost and we asked for way less money than we needed. Our initial campaign is already closed and we got 110% of our target which was close to USD 400. This was enough to pay for the first three days of treatment and the initial exams. That first campaign got us about USD 400 but by the end of the week we had already spent close to USD 500. The costs started piling up and thats why we’re making this page and a new appeal. After many exams (X Ray, Ultrasound) we learn that Torresminho is OK inside (aka no broken internal organs) but his hips, left femur and front left leg are broken. Basically his left side and hips are a mess. The first X Rays of Torresminho displays a Cat so broken that would not be willing to move but the reality is a bit different. Torresminho stands up and tries to walk, he loves to play and is in constant look for food and being pet. He purrs at the mere sight of us and one of the mostly friendly cat we’ve ever seen. Our little needy playful friend looks pretty sharp and we want him to heal completely. Our whishes to see Torresminho treatment complete means that he needs to undergo surgery to fix his femur, Torresminho will become a hero to all cats because he is going full cyborg with some tiny metal plates. He could even pose as a pro bike racer or something after surgery. If we don’t go to surgery, he’ll limp, probably not be able to jump and one of his legs will be on an L shape like a Picasso painting. We’d like the Cyborg version better than the Picasso version. Unfortunately the surgery costs about USD 800 and we can’t afford it. Me and Lili are doing all we can do for Torresminho but we simply don’t have enough money. To paint a clear picture into your mind, while I was writing this post, the cable TV guy came here to pick the Sky STB because we’re canceling the cable TV to cut costs. If we’re cutting cable, imagine how hard it is for us to pay for his treatment. You can help Torresminho by donating money using the PayPal button below. If you can’t contribute in a financial form to help this gorgeous sweet kitten then at least force all your friends and enemies to do it. PayPal accepts all major credit cards. Help us help Torresminho. He already lost 3 lives by being hit by an SUV and surviving. He needs your help not to lose the few remaining lives he has. PS: Whoever wants an update or see exam results from Torresminho can get them by sending me an email at andre@andregarzia.com. In this code first we pick the data from a card using dbCardToArray(), a function that magically picks data from fields, buttons and other controls, and assemble an array that is used to insert or update a given record depending on the presence of an id field. This is just a quick glimpse of what you can do with DB Lib. It is basically a ORM for LiveCode. This is a simple library I made to use in a game we’re making where we needed a way for objects to interact with each other without hard coded object references. This pattern is known as the publisher/subscriber pattern or the observer pattern. This way we can change the UI that reacts to the download without touching the urlstatus message implementation. We could have many controls listening for the downloadProgress event. Also check out how both the urlstatus message and the downloadComplete message trigger the downloadProgress event. None of these messages have any prior knowledge of whom is receiving this event and nothing is hardcoded. Using such patterns, you can decouple your user interface from the inner workings of your application easier than before. In our little game we have stuff such as objects broadcasting events like “exploded” and “died” so that other objects can react. Since in games you tend to create and destroy objects at runtime a lot, this library makes our life easier. This library is released in the public domain. Use it as you see fit, can’t sue me. To download this library, use the link on the sidebar (or link below if you’re using a mobile device).